Some people say that the stress of the "real world" is what stops the laughter from coming. When you grow up there are bills to pay. You`ve got to work a nine-to-five. You`ve got relationship troubles. But come on, people, you don`t think a kid deals with stuff too? There`s a bully on the playground, a math test the next day. Their teeth are falling out of their heads. Parents are yelling at `em to eat their broccoli. Kids have their own problems, but they still find a way to laugh their pint-sized behinds off. So why can`t the adults have some fun? Does it all have to be so darned serious? Why don`t we find the laughter in our lives? I believe we can. 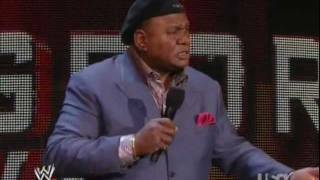 By the age of six George Wallace wanted to be a comedian, but knew he first needed an education. He attended college at the University of Akron, Ohio. Upon graduating with degrees in transportation and marketing, George entered the advertising work force. Still, George`s dream of being a comedian had a strong hold on him. Within a week of leaving the advertising field, he began to perform stand up comedy and was offered a job writing for The Red Foxx Show. George won an American Comedy Award for Best Stand Up Comedian after being continually nominated four years in a row. George`s television credits include HBO One Night Stand, Hallmark`s movie Santa Jr. (2002), Seinfeld, The Parkers, Moesha, The Tonight Show, Oprah, Hollywood Squares, Late Show with David Letterman, Rosie O`Donnell, Live with Regis, Politically Incorrect, Entertainment Tonight, E! Entertainment, Extra and a guest-host on Later on NBC. As well as In the Heat of Night, Tall Hopes, The Fresh Prince of Bel-Air and Arliss. George also appeared in numerous films including Comedian, The Wash, Three Strikes, Little Nicky, A Rage in Harlem, Punchline, Postcards from the Edge, Batmam Forever, and Ladykillers. Las Vegas loves their resident comedic headliner, but even more so, George loves Las Vegas in return. In 2004, George appeared as the headlining star of his own show at The Flamingo Hotel in Las Vegas for a 30 day run. Sin City showed its admiration by extending George`s contract indefinitely. George`s most recognized material is his Yo Mama and I Be Thinkin jokes, which encourage audience participation. Every show George selects a few people out of the crowd to go one on one in comical banter. George shows his gratitude to his audience by signing autographs and taking photos after every show. Unlike any other comedy show in Las Vegas, George gives away a number of prizes every night including CD`s, DVD`s, diamond necklaces, dinners at prestigious restaurants, tropical cruises and even a new car. One of Wallace ongoing jokes is he plans on calling past audience members in the middle of the night... To let them know they haven`t won the car. You never know what will happen at the George Wallace Show. You could end upon George`s radio show Bits on the Strip if you`re caught by the George Wallace Street Team. Wallace is an evolving comedian, which is why your will never see the same show twice -- he`s always thinkin.